Starting this week, you will need only your MyGFU username and password to log in to library databases from off campus. Summit and Foxtrax will still ask for your last name and library barcode. When those systems are replaced at the end of the year, they too will begin using MyGFU credentials. Soon you will never have to type in your 14-digit barcode again! Thank you to all who participated in taking the LibQUAL Library Survey. The Library faculty and staff will be reviewing the data as well as your written comments and appreciate your willingness to share your opinions with us. Congratulations to the following Amazon card winners, whose names were randomly drawn from all who took the survey and entered their email address. Neal, J. (2013). Handbook of faith and spirituality in the workplace: emerging research and practice. New York, NY: Springer. While the field of management has developed as a research discipline over the last century, until the early 1990s there was essentially no acknowledgement that the human spirit plays an important role in the workplace. Over the past twenty years, the tide has begun to turn, as evidenced by the growing number of courses in academia and in corporate training, and an exponential increase in the publications emerging through creative interaction of scholars and practitioners in organizational behavior, workplace diversity, sustainability, innovation, corporate governance, leadership, and corporate wellness, as well as contributions by psychotherapists, theologians, anthropologists, educators, philosophers, and artists. This Handbook is the most comprehensive collection to date of essays by the preeminent researchers and practitioners in faith and spirituality in the workplace, featuring not only the most current research and case examples, but visions of what will be, or should be, emerging over the horizon. It includes essays by the people who helped to pioneer the field as well as essays by up and coming young scholars. Here’s a gallery of cardboard sculptures at the MLRC, both past and present. The digital collections at the University of Massachusetts at Amherst are top-flight and this collection continues that grand tradition. The Antislavery Collection contains several hundred pamphlets and books pertaining to slavery and antislavery in New England from 1725-1911. These items include speeches, sermons, proceedings, and other publications from organizations such as the American Anti-Slavery Society, the American Colonization Society, and a small number of pro-slavery tracts. Visitors can browse the selected titles alphabetically or perform a more detailed search across all of the items. Several documents should not be missed, including speeches by Horace Mann and Ezra Gannett’s “Relation of the North to Slavery” delivered in Boston in 1854. Wondering how to put that iPad to best use in your academic work? This may be the perfect book for you. No limit on the number of people that can view the book simultaneously. As we look forward to celebrating the birth of Jesus Christ, the Prince of Peace, we wish to highlight a few recently-published titles in our Peace Collection, located upstairs in the MLRC. Just spirituality: How faith practices fuel social action. Cannon, M. E. (2013). Downers Grove, IL: IVP Books. Contents: Spiritual practices as fuel for the soul — Mother Teresa: from silence to service — Dietrich Bonhoeffer: from prayer to discipleship — Watchman Nee: from study to evangelism — Martin Luther King, Jr.: from community to proclamation — Fairuz: from worship to freedom — Desmond Tutu: from Sabbath to reconciliation — Oscar Romero: from submission to martyrdom — Courage, joy and celebration. The encyclopedia of peace psychology. Christie, D. J. (2011). Malden, MA: Wiley-Blackwell. This three-volume set examines key concepts, theories, methods, issues, and practices. Includes timely topics such as genocide, hate crimes, torture, terrorism, racism, child abuse, and more. Making peace with the land: God’s call to reconcile with creation. Bahnson, F., & Wirzba, N. (2012). Downers Grove, Ill: IVP Books. Contents: Reconciliation with the land — Learning to see — Reconciliation through Christ — Field, table, communion: the abundant kingdom versus the abundant mirage — Reconciliation through eating — Bread for the whole body of Christ. Many people are not aware that bookworms really do exist — and can do a great deal of damage to library books. The GFU Library was contacted recently by the Friends Yearly Meeting in Hawaii. (Many people are not aware that Hawaiian Quakers exist either, but that’s another matter). They had a collection of old books that they wished to donate to us, as the high humidity there is detrimental to the fragile pages and covers. We gratefully received the books, and evaluated them. Upon inspection, a few showed telltale signs of bookworms. 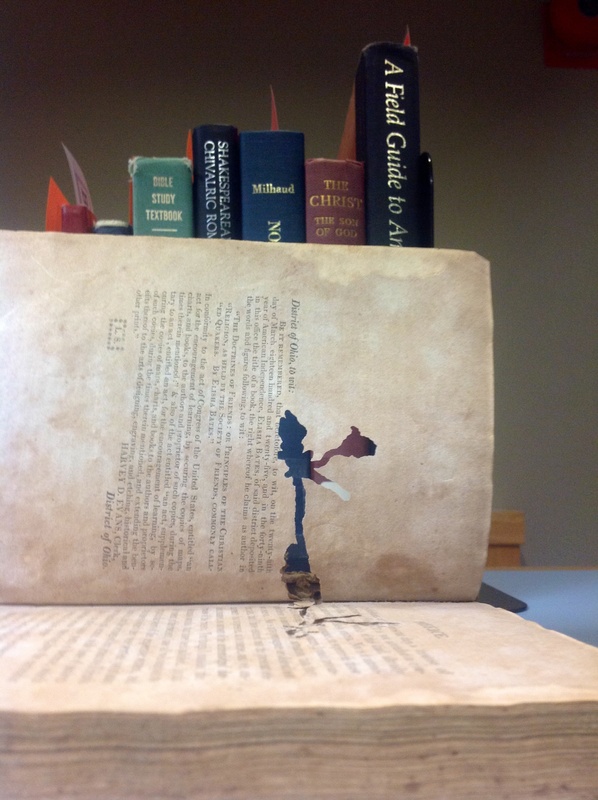 Bookworms, which are actually beetle larvae, can do great damage to books. They consume the pages and the glue in the binding, quickly rendering some valuable older books essentially worthless. Chemicals discouraging bookworms became standard in book manufacturing in the early 1900’s, but older books are still susceptible. So what did we do with the donations from our friends in Hawaii? Library staff froze the books for one week in order to kill any larvae. Books with minimal damage were processed as usual. Those with significant damage, such as the one pictured, had to be discarded. May your own books be intellectually stimulating, personally enriching — and bookworm-free! The library is hosting an open house Friday, Oct. 25, 2013 from 10 a.m. to 4 p.m. The Murdock Learning Resource Center experienced major changes over the summer. Come see our new layout with expanded study space, the new furniture and more. A slideshow will present pictures of university libraries back to the 1890’s. 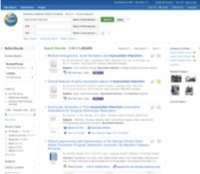 EBSCO has announced a few enhancements to their user interface coming down the pike. Nothing too major, but these do seem to be solid usability improvements. A few noticeable differences appear in the search results (view image). The “Add a Row” has been replaced with +/-. Maximum size & width of custom logo will be enforced. The current on-screen recommendation in EBSCOadmin is set below the maximum allowed. Updated styling, including the font, allows for additional display space. Streamlined layout relocates the number of records returned by the search to directly above the Results List and page navigation to the bottom below the results. Selecting a Limiter, such as Full Text, will immediately update the Results List without the need to click an “Update” button. The “Preview” and “Folder” icons move to align together to the right side of the column, maintaining a consistent location. Publication type icons now appear below the title. Preview hover is now centered inside the screen. Expand/Collapse controls move to the outside corners (includes right column). Changes are scheduled to roll out Oct. 29, 2013. Stay tuned.